It is the rare man who can acquire a nickname in the heat of battle from a soldier who dies very soon after (as did Bee). Stonewall Jackson was a rare man indeed. An aggressive and tactically brilliant commander, his troops were known for their discipline and courage under fire. He was the Confederacy’s most celebrated soldier (apart from Gen. Lee), a darling of Confederate women who took the buttons off his worn uniform as souvenirs. A devout Presbyterian, he disliked fighting on Sundays and was not a vocal proponent of slavery. He was known before the war for organizing Sunday School education classes for slaves in Lexington. At the Battle of Chancellorsville in May 1863, Jackson led a surprise assault on an unguarded flank of a Union army, sending them into retreat. Returning to the Confederate lines after dark on May 2nd, Jackson and his officers were mistaken for Union cavalry and fired upon. Jackson was hit three times, and his injuries were severe enough to require the amputation of his left arm. 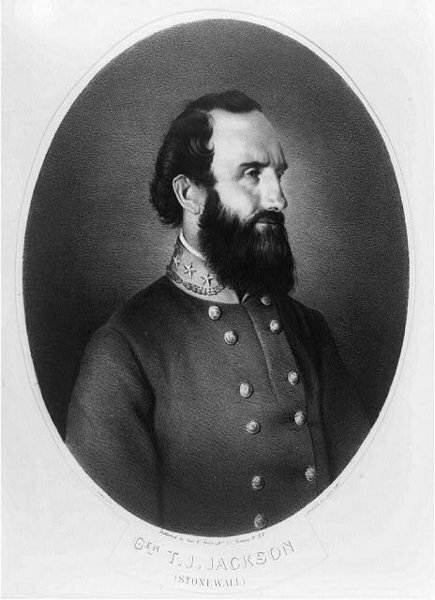 General Lee, upon hearing of Jackson’s amputation, said that Jackson had lost his left arm but Lee had lost his right (awwwwww). So if you find yourself drinking in Virginia (or his birth place, West Virginia, where lord knows one should drink), resting under the shade of the trees, pour one out for General Stonewall Jackson. Oh, and whatever you have, it needs to be on the rocks. Sorry, too easy. Also, the pour is more fitting if you made the drink using only vague instructions that identified only the overall objectives. In high school in Virginia, we got off for Lee-Jackson-King day. Robert E Lee, Stonewall Jackson, and MLK–all sharing one holiday happily together. Virginia has a lot of respect for the man. Military history, briefly, in cocktail form.